The U.S. military aborted a short-range ballistic missile defense test off Barking Sands, Kauai, yesterday after a target missile malfunctioned shortly after launch. The failure halted the U.S. Missile Defense Agency's first attempt to fire two interceptors at one target using the terminal ground-based missile defense system. It was the first breakdown after five successful tests of the Terminal High Altitude Area Defense system, or THAAD. The defense agency says because of the failure, the two THAAD interceptor missiles that were to take part in the test were not launched. So the full test was never completed. The military group says it will review data from the failed test in an extensive investigation of the cause of the malfunction in the target launch. The Hawaii Medical Service Association will provide travel support funding for up to 25 medical students to perform primary care clinical rotations on the neighbor islands. The association's goal is to expand the number of physicians to practice on the neighbor islands. The HMSA Medical School Travel Support Program will be administered by the Hawaii/Pacific Basin Area Health Education Center program at the University of Hawaii John Burns School of Medicine and the medical school's Office of Medical Education. HMSA has made a commitment of $103,800 in travel support grants this year. Dr. Jill Omori, director of pre-doctoral education for the Department of Family Medicine and Community Health, said many former students who had trained on the neighbor islands are currently practicing there. "With the rising costs of airfare and housing, it would be very difficult for us to continue our rural training programs without the support from concerned organizations like HMSA," said Omori in a news release. About 15 medical students from the John Burns School of Medicine perform six-week rotations on the neighbor islands annually. An additional 10 students perform five-month rotations in rural areas. The state wants the public to share ideas about what statewide outdoor recreation programs and priorities should be in the future. The Department of Land and Natural Resources will hold public meetings on all islands next month to update the Statewide Comprehensive Outdoor Recreation Plan. Everything from ball fields and golf courses to hiking, hunting, boating and fishing facilities will be open for discussion, according to an announcement. Updating the plan is required for the state to be eligible for federal grants from the Land and Water Conservation Fund, administered by the National Park Service. People may also participate in a user survey available on the state Web page: www.hawaiistateparks.org. The survey may be returned by mail, fax or e-mail. It must be submitted by Oct. 15. » Oct. 1, 5:30 p.m., Kalana Pakui Building, Room 250, Wailuku. » Oct. 2, 11 a.m., Lanai Public Library. » Oct. 6, 5:30 p.m., Aupuni Center conference room, Hilo. » Oct. 7, 5:30 p.m. Old Kona Airport pavilion, Kailua-Kona. » Oct. 8, 3:30 p.m., Department of Hawaiian Homelands, Kaunakakai. » Oct. 9, 6 p.m., Lihue Civic Center, Lihue. Oct. 14, 5:30 p.m., DLNR board room, 1151 Punchbowl St., Honolulu. Police, using DNA and other evidence, arrested a 42-year-old man who allegedly stole items from a car he broke into in Hawaii Kai a year ago. The suspect was arrested Sept. 11 at Oahu Community Correctional Center on suspicion of first-degree unauthorized entry into a motor vehicle. When a match for the man's DNA, recovered from inside the vehicle, came up within the law enforcement database, the suspect was identified and arrested, police said. The suspect allegedly broke into the car on Aug. 26, 2007. He remains in custody on other unrelated charges. Police want help in finding a man who robbed two other men while brandishing an "Uzi-type" submachine gun. The victims, ages 19 and 20, were sitting on a bench at Kanewai Park at 2695 Dole St. near the University of Hawaii dormitories about 9:35 p.m. Monday when a man approached them brandishing the gun and demanding money. After taking cash from the victims, the suspect fled on foot into the park, police said. 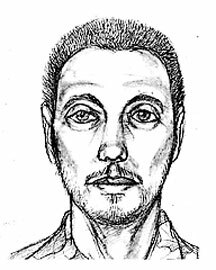 The suspect is described as 20 to 30 years old, 5 feet 11 inches to 6 feet tall, weighing about 180 to 200 pounds, with short black hair, a mustache and a scruffy beard. He was wearing a green Army camouflage jacket with "Liloa" on the name tag, and dark long pants. Anyone with information is asked to call CrimeStoppers at 955-8300. Police charged a 31-year-old man who allegedly kidnapped his ex-girlfriend at gunpoint last week and threatened to kill her while driving around the island. Police arrested Toi Nofoa at a home on Helelua Street in Nanakuli about 12:50 p.m. yesterday. He was later charged with kidnapping and first-degree terroristic threatening. His bail was set at $75,000.